There’s a country in Europe where citizens access something useful with their secured digital ID at least once a month. Unfortunately, that country is Finland – not the UK. But could we make use of Digital Identity more of a regular habit for Brits if we took some notice of what the canny Finns did right – and wrong – before us? That’s the strong advice of someone well placed to comment – Simon Wood, CEO of Ubisecure, which has been helping enterprises benefit from external identities since in 2002, when the company was founded in Finland with a goal to “simplify the complex identity and security challenges faced by developers when building applications”. And Wood says a lot of what his company and policymakers, ID vendors, banks and citizens alike have learned about Digital Identity in the Finnish context could be great use to their UK counterparts. “Finns are touched by Digital Identity at least once a month, if not more,” he told delegates at last Thursday’s packed Think Digital Identity for Government 2018 conference in Westminster, where he was interviewed on-stage by the event’s chair, well-known pubsec IT journalist David Bicknell, on the theme of ‘Identity In Action’. Like the US with its focus on the Social Security number as the primary ID tag, Finland also has one central identifier, the government-issued ID, he added. But from very early days the government insisted on working with the private sector – and especially banking and financial service organisations – to provide an easy and familiar main way to access services, he pointed out. That means that the UK isn’t “behind”, as we don’t have an equivalent national ID scheme, but instead that we should be looking to find equally common and convenient ways for citizens to start learning how much more convenient it is to use an electronic proof of identity to get what they want. “We need a consistent and strongly-authenticated identity in mass use to create the means for building true attribute-sharing services,” he suggested to delegates. 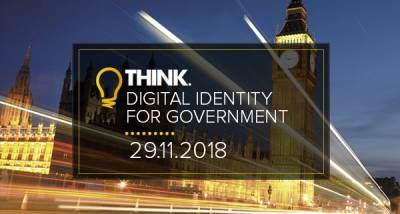 Ubisecure was one of the main sponsors of Think Digital Identity for Government 2018.